2Department of Vascular, Neuro and Interventional Radiology, Faculty of Medicine, Al-Baha University, Kingdom of Saudi Arabia. Introduction: Thyroglossal duct cyst (TGDC) is a congenital malformation caused by failure of obliteration of the thyroglossal duct. It presents at any age and often requires surgical excision. This study was done to study our cases of TGDC to get some conclusions that may help the management of such cases. 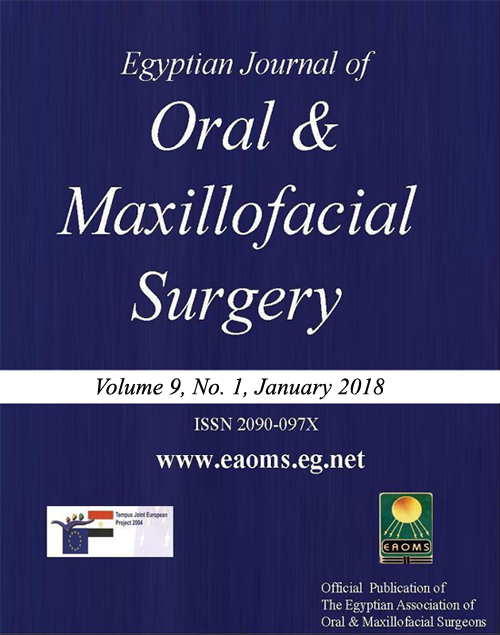 Patients and Methods: This is a prospective study done at the Maxillofacial Surgery Unit, General Surgery Department, Sohag University Hospital, Sohag, Egypt in collaboration with Vascular, Neuro and Interventional Radiology Departments, Faculty of Medicine, Al-Baha University, Kingdom of Saudi Arabia. It included patients with the diagnosis of TGDC who were managed between July 2011 and June 2017. Their charts were reviewed for the demographics, clinical presentations, radiological investigations, management, and outcome. Results: The study included 60 patients; 41 (68.3%) men and 19 (26.7%) women. The age of the patients ranged between 2 and 29 years; 45 (75%) patients were under 10 years. The complaint was neck mass in 49 (81.6%) patients, discharging opening in 11 (18.4%) patients. All cases were primary cases. The cyst or fistula opening was located adjacent to the hyoid bone in 51 (85%) patients, infrahyoid in seven (11.7%) patients, and suprahyoid in two (3.3%) patients. Neck ultrasonography in all patients detected the cyst and its location and assured that the thyroid gland was present in its normal location. These patients were treated by the classical Sistrunk procedure. The follow-up period ranged between 3 and 30 weeks. One patient had recurrence and operated on 1 year later. Conclusion: TGDC is the most common cervical congenital anomaly. It can be found in all age groups, with the highest incidence in pediatric males. Although, it is diagnosed clinically in most of the cases, the use of radiological investigations can improve the diagnosis. The knowledge of embryology, meticulous dissection along anatomical planes, and excision of the core of the hyoid bone is essential to decrease recurrence of TGDC.